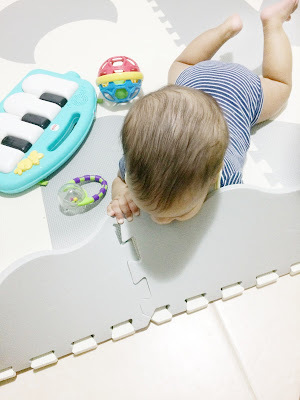 CHILDLIKEBEHAVIOR - The Best Interlocking Foam Baby Play Mat! Baby play mats are probably the most practical and versatile baby product available on the market today. 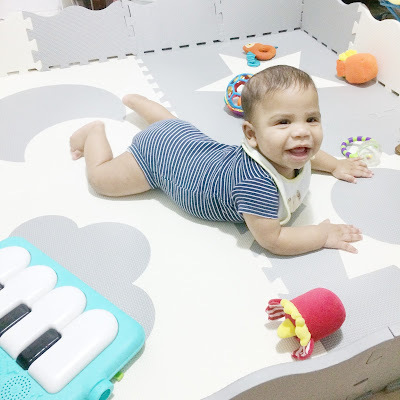 A baby play mat is one of the best ways to give your baby a comfortable and safe place as it provides many benefits that are important for proper baby development. 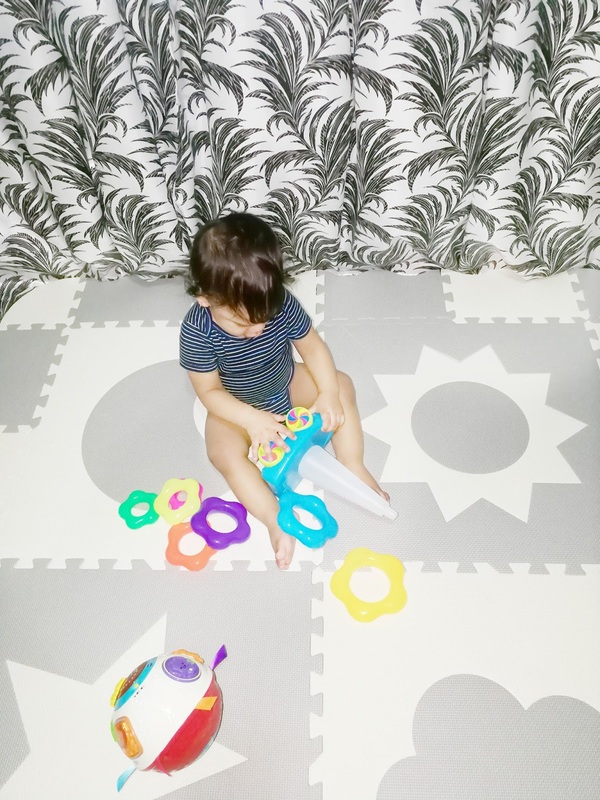 I was so fed up of seeing those obnoxiously brightly colored floor tiles that turn your home into a pre-school classroom. I really didn't want to get that for my little one nor did I want those ugly play mats in my home clashing with my decor, but I felt bad denying our little one the opportunity of having a play mat. Thankfully Childlike Behavior has heard my cry and they created a brand of all-new chic Interlocking Foam Baby Play Mat tiles. 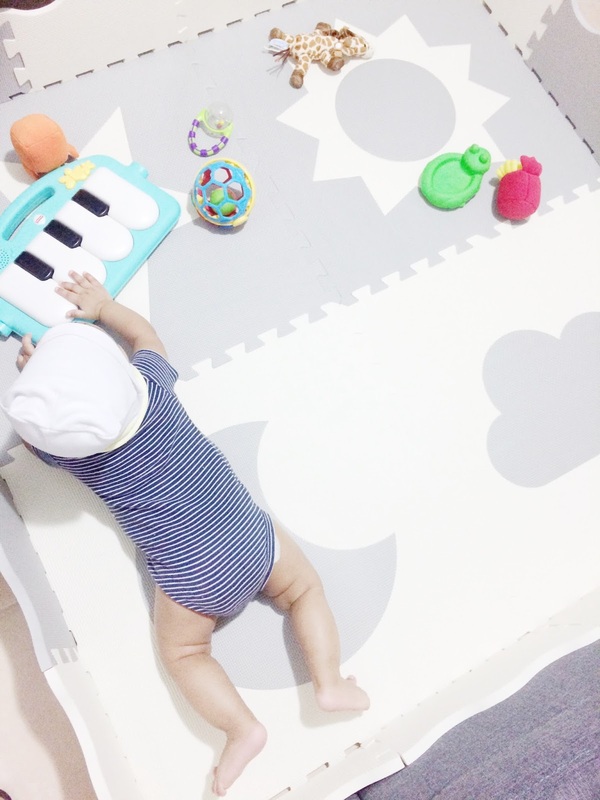 They are thick, soft, and elegant tiles that are available in beautiful pastel colors. Each tile contains a fun shape - a removable sun, moon, star, and cloud shapes for hours of infant entertainment. The tiles are designed to fit together tightly and I've never had a problem with them pulling apart while my little one was playing. 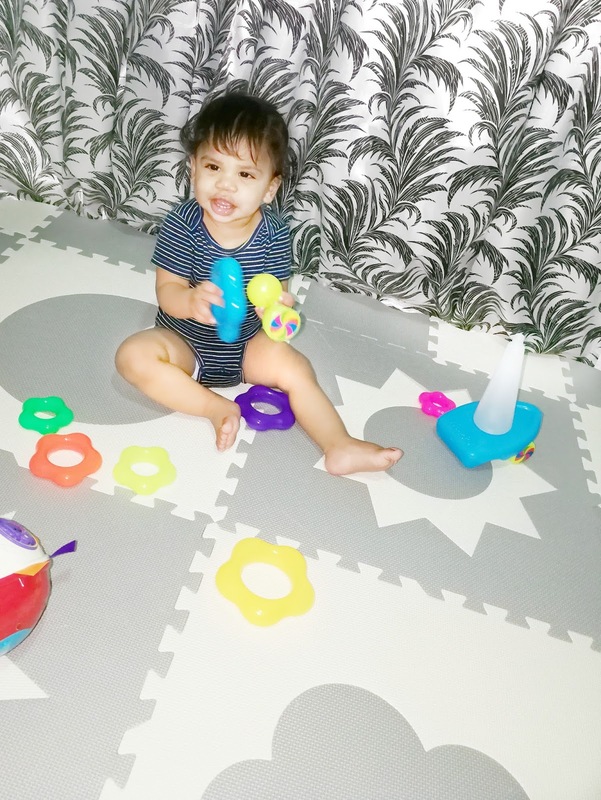 They are double the size of most play mats I've seen on the market which means fewer pieces for less tidying up, easy assembly and easy transportation. Since we have mostly tile flooring I needed something thick yet soft to protect my little guy from those unavoidable bumps and falls. This play mat is a soft, half-inch thick plush surface and it is rated safe for infant use (unlike other puzzle-piece playmats), making it the perfect option from birth onward. My baby loved laying down, rolling over, crawling and having tummy time on this mat. Now that he's older he enjoys practicing his walking skills, creeping and sitting playing with his toys. The fence pieces created side walls making it perfect for containing my infant and all his toys. 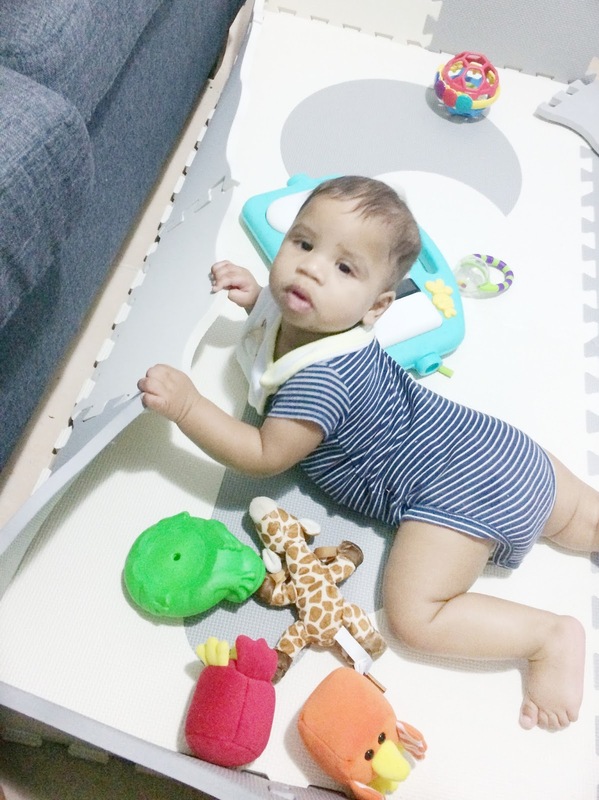 I simply put them down to make a larger crawling mat when he got older. The quality is excellent, no cheap foam that breaks apart. 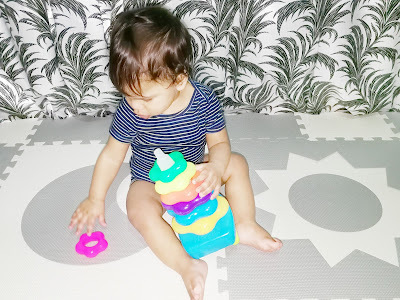 My little guy puts everything in his mouth including the edges of the mat and it still looks brand new! I love how it is completely waterproof too. It's really easy to clean with a damp cloth and a mild detergent if need be. And I've left the best for last! "You mean there is still more awesome pros to this mat?" Yes, there is!!! 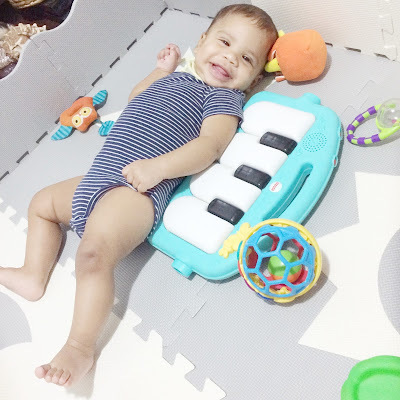 To make life easier Childlike Behavior has provided a simple but elegant zip-up carrying case for easy on-the-go transportation anywhere you want to take you play mat to; it is lightweight and so convenient I cannot recommend it enough! What are you waiting for? Get one for your kid or make this your ideal baby shower gift for that new mommy! We had foam mats that we used everyday. They are such a great idea, and these look so attractive.